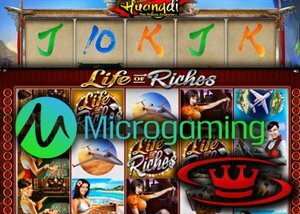 Microgaming is welcoming in the New Year with the release of a new video slot, one that is exciting and offers a unique theme. Huangdi: The Yellow Emperor is one for the history books and gets ready to take you into the mystical world of inventions that were deemed revolutionary for their time and combines it with the beauty of ancient symbols and realistic calligraphy. The game gets under way with a soundtrack that is unique and depicts images of Chinese instruments that are traditional of its culture, and those sounds continue as you enter and begin spinning the reels. It builds a sense of tradition but one of excitement for what is to come and that is something Microgaming is well-steeped at creating within its newest video slot creations. Offering wonderfully designed graphics, the images within its background display the Zhuolu battlefield and only add to the history and curiosity that is felt from a time in the past, yet all the while giving the impression that those days are not that far gone. Designed with 5 reels and 25 paylines, it includes some wonderful features such as expanding symbols, stacked symbols, and free spins. The artwork that is displayed within its symbols is nothing short of perfection. Whether seeing the golden dragon depicted in gold, or the Huangdi logo that is showcased in gold and red with ornate gold designs. The brilliance of the design work carries through to the regular symbols with Huangdi and his rich, dark flowing hair, his ceremonial sword, or the ornate box that carries items of importance. Even its lower value symbols appear as written with the stroke of a Chinese hand. One nice aspect as you hit the big wins is the burst of gold coins is designed as ancient coins from the Chinese dynasty and that just adds credibility to its overall theme. The new Huangdi: The Yellow Emperor Slot has been released on all platforms including instant play, mobile, and desktop. It offers a minimum bet of $0.25, a maximum of $250 and can return wins up to 30,000 coins. You can enjoy this slot at JackpotCity online casino, a casino that was voted the best, where you will be met with an enticing no deposit free spins bonus!